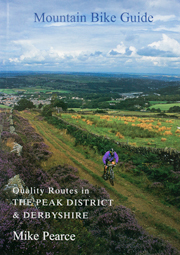 "The Mountain Bike Guide to The Peak District and Derbyshire" is a printed guide book for off-road cycling in this superb part of the British Isles - see cover illustration on the left. The UK has many great areas for mountain biking, but nowhere else offers such a superb contrast between gentle farmland rides in the south of the county, the fast and open limestone valleys in the central part of the area and the bleak, beautiful moorland of the higher hills - all threaded by a complex and interesting set of paths, trails and historic tracks. The book is available online from The Ernest Press or from www.amazon.co.uk, at good bookshops nationwide and also cafes, visitor centres and tourist information points in the area. Riding in the Peak and Derbyshire is a great experience. What are you doing next weekend?